So wanna hear something kind of creepy? Exactly one year ago today, I posted a recipe for a Crockpot Pork Roast with Sauerkraut and Apples. 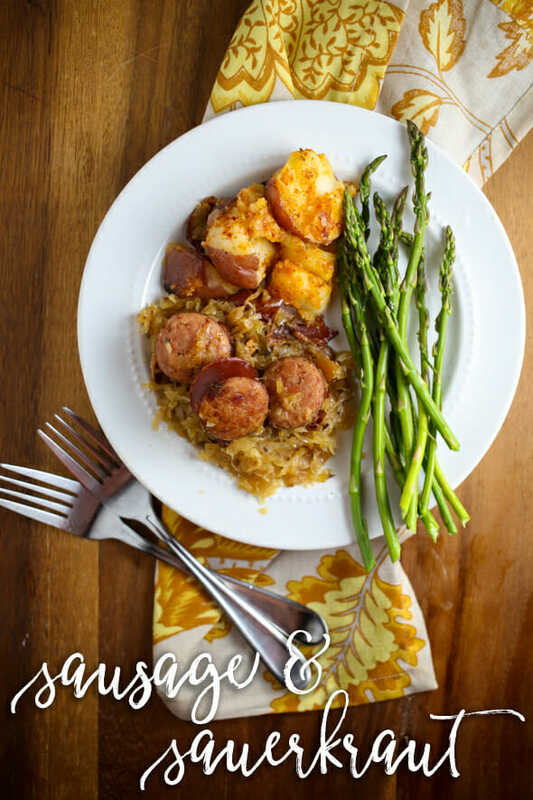 And then today, I’m posting a recipe for Sausage and Sauerkraut, which is basically the same thing, only with more brown sugar, sausage, and bacon, so, you know, all the basic food groups are covered here. I wasn’t intending to post both recipes on the same day (apparently traditional German food really speaks to me at the end of February. Or something.) But these are both huge favorites around our house and both things I grew up eating on a very regular basis. In fact, I’m pretty sure the first two things I remember my mom teaching me how to cook were pancakes and sausage and sauerkraut (not together…thank goodness…), and that this is the first meal I ever made completely on my own. Not this recipe because I’m not sure my mom really followed a recipe and I haven’t had a ton of luck asking her for recipes from beyond the grave. So. Since she didn’t write this stuff down, I’ve had to rely on my other mother, the internet. At church, I teach the children’s music every week. We do a lot of weird things. The nursery kids have all learned to cradle the Beanie Baby cats I bring and sing “Soft Kitty.” This week, we played Pie Face, turning the crank when we sang certain words. It was highly reverent and spiritual. And, being the lover of food that I am, I often bring food, but not brownies or cookies or things you’d think they love; it’s almost always when we’re learning something about another country. On Pioneer Day, we’ve shaken jars of cream into butter and had old-fashioned candy. One Christmas when we were talking about what the first Christmas might have been like, we had flatbread and goat cheese and pomegranates. One particularly lively Hebrew-themed lesson ended in dancing the Hora and eating challah bread. And last year at Christmas time, I taught the first verse of Silent Night in German and we had a little German feast–spiced cookies, sparkling apple cider, and sausage and sauerkraut. And believe it or not, this was a big-time favorite. Kids gobbled it up. Adults who claimed to have a life-long aversion to sauerkraut were scraping it out of the bottom of the crockpot. Adult men were leering into the kitchen, wondering what in the world smelled so good and could they have some (um, only if you come wrangle kids for two hours.) This has become a huge favorite in our family and I’ve had countless requests for the recipe, so the moment has come. Now. This recipe is kind of time consuming (but also very hands-off), no matter how you crack it. You simmer the sauerkraut for a long time, which is kind of a pain, but it also makes everything quite delicious. That said, you can split these steps up. 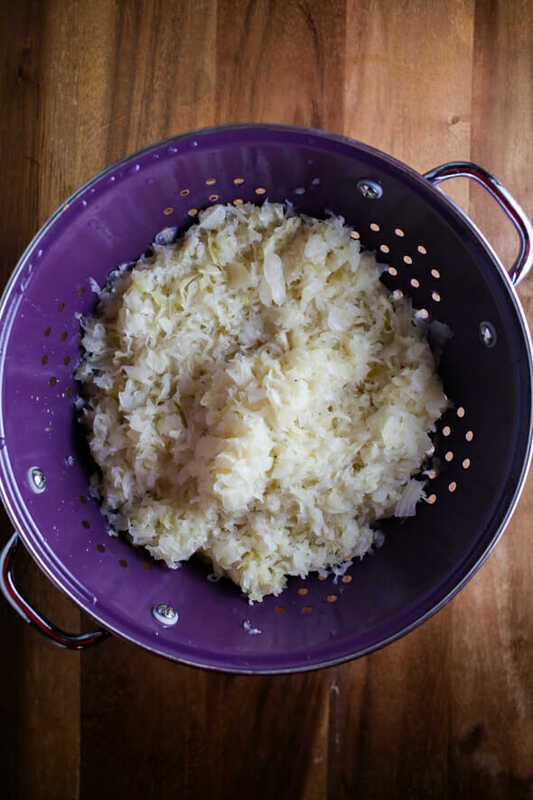 Simmer the sauerkraut the night before after your kids are in bed and then you can pop everything together the next day. Or do it earlier in the day. This is all very forgiving, so if breaking the recipe down into smaller pieces over a day or two works better for your schedule, totally go for it. 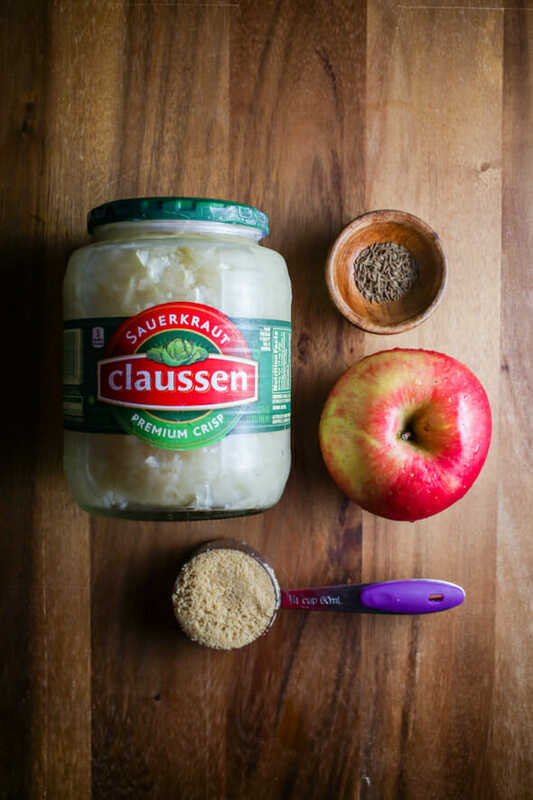 For the first part of this recipe, you’ll need 2 pounds of sauerkraut (the good stuff that you get from the refrigerator section, not from a can), an apple, some caraway seeds, and some brown sugar. dice that apple, determine how many caraway seeds you want to use (the recipe I adapted this from calls for a tablespoon. They must really like caraway seeds. I’ve omitted them altogether and this time around I used 1 teaspoon; unless you have strong feelings about caraway seeds, I think a teaspoon is plenty), and leave the brown sugar alone because brown sugar is perfect just as it is and needs no alterations. Combine all these ingredients in a large saucepan or Dutch Oven. Bring to a simmer over medium heat, then reduce heat to medium-low, cover, and simmer for 90 minutes-2 hours, stirring occasionally. and bake for 20-25 minutes or until crisp. Remove from oven, drain the bacon on paper towels, and crumble the bacon. Set aside. 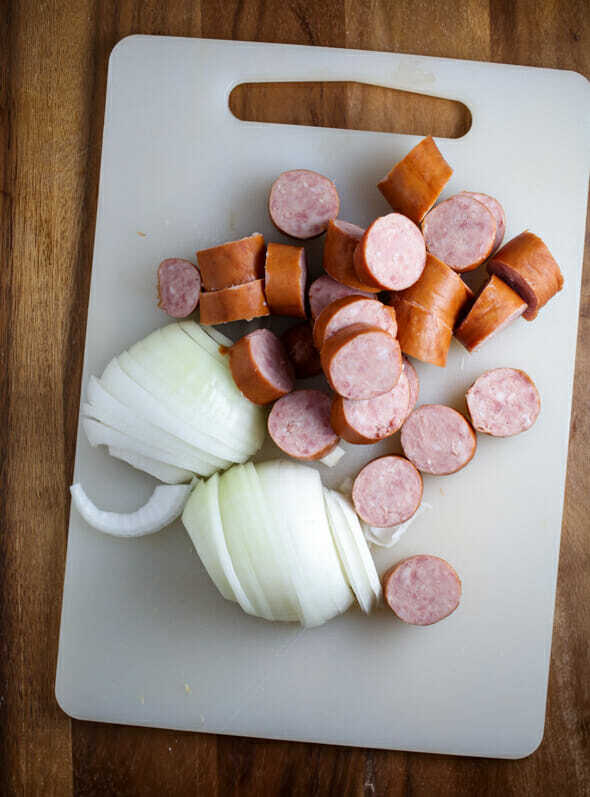 Cut a medium onion in half and then slice it and slice the Kielbasa into 1″ slices. If you used a baking sheet, transfer 2 tablespoons of the bacon drippings to a frying pan. 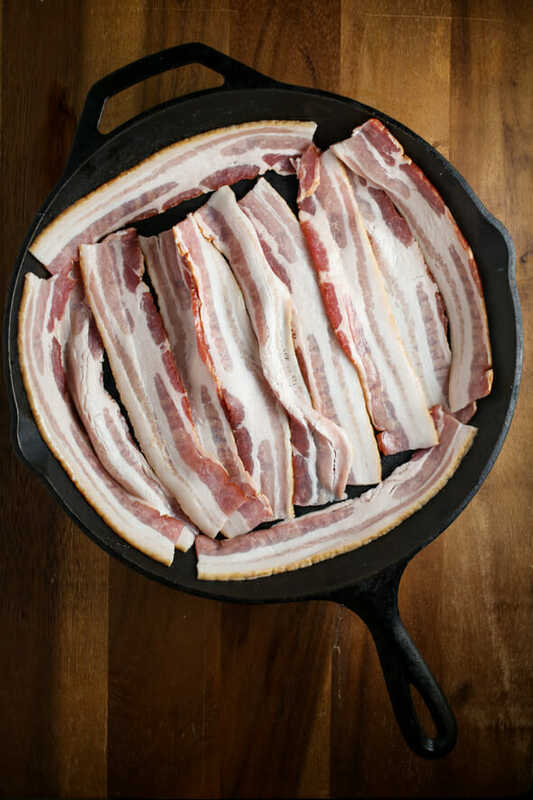 If you used a cast iron pan, drain all but about 2 tablespoons of bacon drippings and return the pan to the stove. Heat the drippings over medium heat. When hot, add the sliced onions and kielbasa. 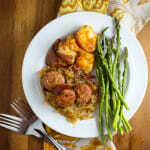 Cook for 10-15 minutes, stirring frequently, until the onions are caramelized and the sausage is crisping up on the edges. Transfer the onions, sausage, crumbled bacon, and sauerkraut mixture to a slow cooker and cook on high for 2-3 hours or on low for 4-6 hours. Serve with German potato salad or roasted potatoes. This traditional German recipe takes a little bit of work, but it’s well worth the effort–definitely a family favorite around our house! 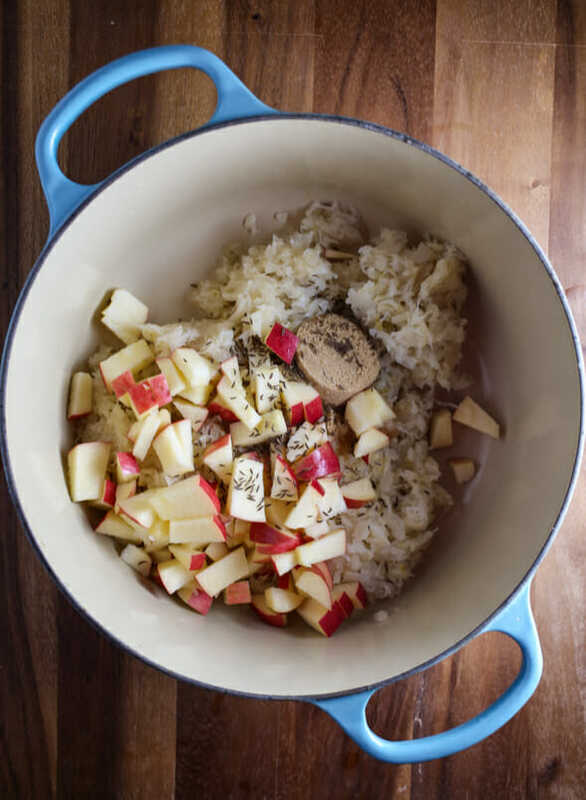 In a large saucepan or Dutch Oven, combine the sauerkraut, diced apple, caraway seeds (if you’re using them), and brown sugar. Bring to a simmer over medium heat, then reduce heat to medium-low, cover, and simmer for 90 minutes-2 hours, stirring occasionally. When the sauerkraut is almost done simmering, preheat oven and place the bacon on a foil-lined baking sheet or in a large cast iron pan and bake for 20-25 minutes or until crisp. Remove from oven, drain the bacon on paper towels, and crumble the bacon. Set aside. If you’d rather finish this up in the oven instead of the crockpot, bake in an oven heated to 325 degrees F for 1 hour. Wow- I’m Primary chorister too, but I’ve never brought food- where do you find the time in your (sometimes) 20 minute block to teach about the song and sing it AND still do food?! wow- can I come to your primary?! The recipe calls for “1 1/2 ounces kielbasa”? Should this be 1 1/2 pounds? Eek! Yes!! Off to fix it, haha! Why am I not surprised your singing time is so legit!? Awesome. I’ve never had sauerkraut before. I’m sure I’d like it. And my family likes anything with kielbasa in it so….sold. Oh Kate, I just know we’d be best friends if we lived in the same ward! Primary music leader was my favorite calling ever! And I love variations on sauerkraut cooked with brats, pork, or sausage. I can’t wait to try this one! This looks delicious! We’re going to have to give it a try soon! This sounds heavenly. I can’t wait to make it. Thank you! I am pretty sure you are the best Primary Chorister who has ever lived. It was last year’s pork with sauerkraut and apples that convinced me I didn’t hate sauerkraut! I’m not sure where I’ll find kielbasa in rural NS, but if I can get my hands on some I’ll give it a try! And I’m so glad you don’t hate sauerkraut! That is a win! ? My mother made this with bisquick dumplings on top, and we loved it. I think it came from her Pennsylvania Dutch ancestry. Holy moly, must made this tonight and it was soooo delicious. My 4 1/2 year old came in the house after preschool and immediately said, “wow, it smells amazing in here!” and then gobbled dinner up, exclaiming “I love this sauerkraut”. She’s a good eater anyway, but she isn’t usually so vocal in her praise. Next to Spicy Honey Chicken, this might be my favorite recipe you have ever posted. Yes!!! This makes me so happy!!! Soft kitty with the nursery kids? Fantastic. Oops – recipe in process and I realized I didn’t drain and rinse the sauerkraut. I just dumped it in the sauce pan. Will it be okay? Yep, you should be fine!